This board came out in 1977. Being a 16-bit CPU it was way ahead of its time. It is now a very rare board. DATA CHIP. The data chip provided the interfacing capability for data and addressing. A 16-bit Data and Address bus (DAL) interfaced the CPU to external logic. It also contained eight l6-bit registers, the Arithmetic Logic Unit (ALU), microinstruction bus lines, and some microinstruction decoding logic. CONTROL CHIP. The control chip contained the microinstruction address register which controlled accessing of the microinstructions. It also contained translation array logic and the interrupt logic. The master timing control was directed by the control chip which indicated when an address was valid on the data address lines and indicated a read or write operation and a byte or word operation. MICROM CHIPS (3). The microm chips were 512 word by 22 bit ROMs which were programmed to Alpha Micro specifications. These 22-bit outputs comprised the microinstruction bus (MIB) that allowed the chips in the CPU to communicate with each other (MIB00-MIB21). Each ROM location contained a l6-bit microinstruction, two control bits, and four auxiliary bits. The l6-bit microinstructions and the two control bits form a high impedance tri-state bus. Bits MIB18-MIB2l were the auxiliary bits and were the state codes that directed external logic to perform special functions. MICROINSTRUCTION BUS. The Microinstruction Bus (MIB) was a high impedance MOS bus for data transmission between the chips in the CPU and was very sensitive to external monitoring even with oscilloscope probes. The capacitors located on CPU 1 suppressed noise and optimize data transmission on the bus. Bits MIB00-MIB10 served a dual purpose, During the portion of the cycle that addresses the microinstruction from the microm, these bits contain the 11-bit address. During another part of the cycle, they are used to transmit the microinstruction to the other chips. Bits MIB11-MIB17 just transferred part of the microinstruction. Therefore, during the address phase, MIB00-MIB10 addressed the microinstruction and during another phase MIB00-MIB17 transferred the microinstruction. The board utilized a 4MHZ crystal divided by to to give a 2MHZ CPU clock and Clock 1 & 2 on the S-100 bus. The chips themselves used a 4 phase clock signal. The CPU set could recognize 4 hardware interrupts. Where it "wandered" from the S-100 bus was that it had 7 levels of DMA capability utilizing unused S-100 lines for signals. Since some of these lines were critical for 16-bit transfers with the IEEE-696 specifications this CPU board would not work with later S-100 systems. Indeed while Alpha Micro first supplied the system in an IMSAI box the front panel switches did nothing. Later of course they had their own box. Later on Alpha Micro combined both boards into one double height board called the AM100T. They also added new 2 serial ports and another port for the status display. 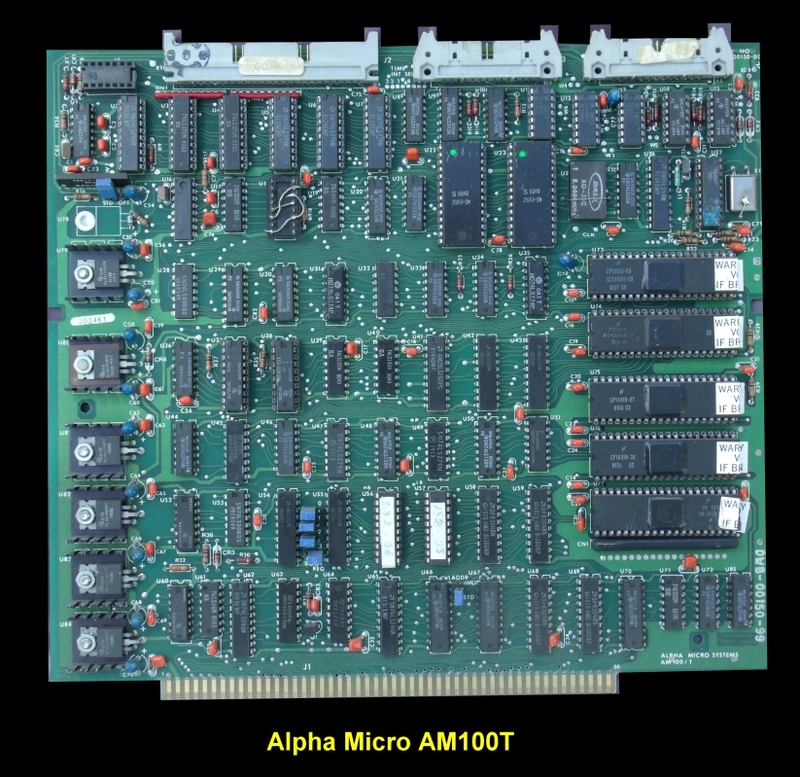 Alpha micro had numerous systems over the years. Most were not in fact S-100 systems. One place where Alpha Micro really excelled was with their documentation. Even today an extensive web site of documentation exists and can be obtained here. The excellent and detailed manual for this board can be obtained here. A description of the WD16 Instruction Op-codes can be obtained here. Hank Kee back in Aug 1981 wrote a brief review of the system for Microsystems (Vol 2, #4, p 26). It can be obtained here.